Description: The perfect topping to any wedding cake is a sugary statue colored with dye and too cute to eat, but too delicious to deny. 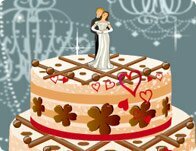 Customize your own cake topper with sugary flowers and a tasty tuxedo! Instructions: Use your mouse to click on and through the floating clothing, hair, background, and accessory options for this daring duo.